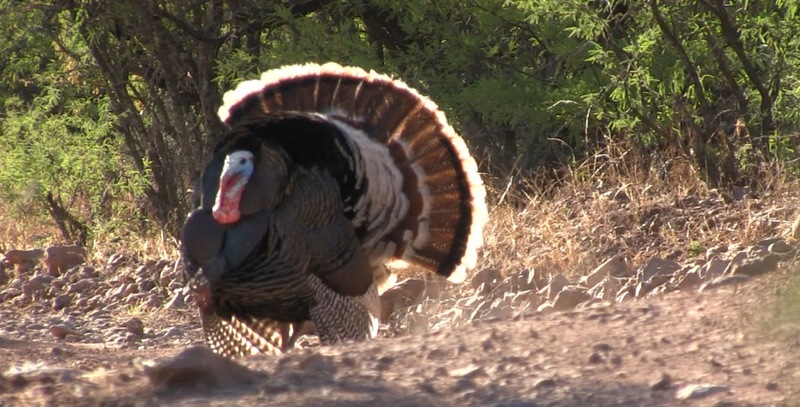 We have a bunch of different Gould's turkey ranches that we lease and hunt in Sonora, Mexico that span over 200,000 acres. Jay Scott and his guides are the host of all of the trips. We offer a very personalized hunt. We hunt in Sonora, Mexico. Hunters fly into Tucson International Airport and have a 1.5 hour drive (rental car) to our border crossing city of Douglas, AZ. The hunters will stay in a motel room the night before and the guides will pick you up the next morning to head to the ranch. After being picked up we will go directly to the ranch. One of the benefits of our hunts that separate us from some of the others is our easy travel and quick access to the hunting grounds. Most hunts are 3-4 days. Our shotgun hunters have gone 100% on our Gould's turkey hunts. Hunters can bring their own guns and ammo for a fee or use our shotguns for free. All hunters will be required to buy a Tourista Visa for approximately $27.00. Call or email Jay Scott 602-803-0223 or jayscottoutdoors@gmail.com for available dates, pricing and more information. A typical day of hunting with us for Gould's turkeys goes like this: Arrive at ranch in the afternoon in time to get an afternoon/evening hunt in. We roost birds every night so that we have a great setup for the next mornings hunt. The next morning we are up very early and get out to our roosting location and get prepared for the birds to start gobbling. We settle in and wait. We have good success usually right off of the limb. We set out Dave Smith Decoys and try to be in the right place at the right time first thing in the morning. We believe that setup is everything in order to be most efficient. If the roost setup doesn't yield a big Gould's gobbler then we go to the run-and-gun method. We head out on foot or in the Ranger to find some birds. We stop often to try and strike a bird. We repeat the process until we get a active group of birds. We then get a late morning to midday lunch and a siesta. We then head out in the afternoon and repeat the whole process until we have filled out on our birds. We take lots of photos and video of the whole adventure from start to finish. Gould's turkeys are usually very vocal and we rely on calling to harvest our birds. You can get a feel of our turkey hunting style by watching our videos on this website. We have helped guys complete their Royal Slam and World Slams.